This year's Bristol show was a rather quiet affair, with not too many significant product launches. Maybe the reviving London Heathrow show has to do with it. But who am I to complain? The wheather was brilliant, we had four days of solid fun, and yes, there were three entirely new turntables launched at the show: one I was in the know of (for more than a year), and two utter surprises. Let's begin with Avid. Upon request of his Japanese distributor, TEAC, Conrad Mas created something so unlike the Volvere and Acutus that it even isn't remotely recognizable as an Avid. The still-unnamed deck is a spindly spiderlike affair with five legs radiating away from a central bearing. Three legs support this bearing on springs stolen from the Volvere, while the two other legs are in fact rails carrying each an armboard and tonearm. Depending on the version ordered the legs and rails are sized to carry 9" and/or 12" arms, the cheapest and smallest version costing UKP1100. Enter the Michell Engineering room then. Enter the TecnoDec. 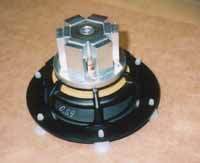 Take the Gyro's black platter and smooth-running DC motor. Take a similar inverted bearing. Marry these to a svelte acrylic plinth, and you get the Tecno. Michell's newest offering, and priced to sit way below the Gyro SE. Pricewise this may be the successor to the Syncro and Mycro models of yore, spiritually this design is more like a descendant of the Focus One: it has no suspension. And I want one. Enough said. On John's new offering was found a Michell-modified RB-250 arm, sporting a complex and precisely-adjustable counterweight and upgraded wiring. 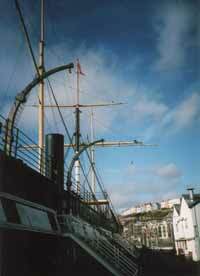 A name and pricetag for the arm are still to be decided. But there was even more: the VC power supply for the Gyro is no more. Gone. Forever. It has been replaced with a small grey box that is confusingly named the 'HR', and which contains a novel power circuit said to smoke the old VC. Oh, and the HR will be cheaper, too. 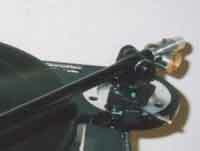 The VC's top-hat design is still used on the Orbe series of turntables (with the tacho feedback), but these supplies are now renamed as 'Orbe Controllers'. Co-inhabitants Trichord had no finished new products, although the new power supply concept mentioned above will eventually find its place in the Orca, Dino, and Delphini preamps. The power amp used was a digital prototype, but there are no firm plans for releasing it. At the other side of the corridor Stig Bjorge of Scantech demonstrated Lyra's new UKP900 cartridge, the frog-green Argo, and Lyra's almost-finished not-unaffordable Erodion MC phonostage, designed by Jonathan Carr of Connoisseur Definitions fame. 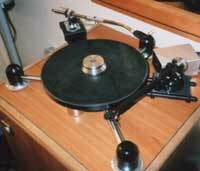 The turntable in-between was a TecnoDec! But tucked away in a corner at Henley's, almost hidden even, was the biggest surprise of them all: Roksan's new Radius 5 turntable and Nima unipivot tonearm. Made in roundly-shaped layers of clear acrylic, the '5 does not resemble any older Roksan at all, although while lacking a suspension it of course features the company's resiliently-mounter motor. 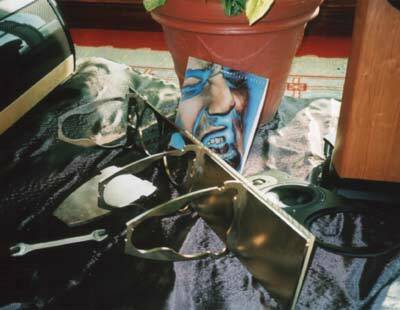 The Nima is interesting too, as many major parts of the arm are made of acrylic as well. Other news at Roksan were the Kandy series III integrated amplifier and DVD player, demonstrated with a Pro-Ject RPM6 turntable and Vienna Schonberg speakers. Pro-Ject are diversifying (if you ignore the PJ integrated amp of many years ago). 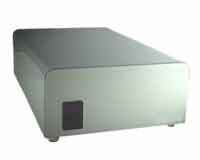 The Prebox and Powerbox are new tiny amplification components shaped a bit like the Phonobox SE seen last year. What then with the Response D80? The second all-new ProAc in the new D series, and positively tall, this big ProAc marks a different way for this manufacturer. It is positioned a bit under the huge Response 4, and shares with it the architecture of two woofers, two dome midranges, and one dome tweeter. The amazing thing is that, even in a suboptimal hotel room, this is the first big loudspeaker I encounter that at times can sound frighteningly real, at high and low listening levels alike, and this entirely without the nasties I normally attribute to big-$ high-end gear. I love it, but definitely can't afford it. Gallo demonstrated the intriguing and surprisingly small Due with its weird leaf tweeter (think Linaeum, and then some). Added to the line are the spherical A'Divae, and the sounds made there were relatively nice. B&W promised a treat: a multichannel demonstration under the auspices of recording guru Tony Faulkner. Employing top-line Classe electronics (including the SACD), Nautili Signature 800 for fronts and Signature 805s for rears, sourced by hires recordings from hard-disk, the sound could not really touch me, despite the relatively quiet and controlled environment. Yes, loud and extremely dynamic, but also like shattered glass during climaxes. 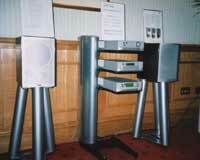 From Arcam there was finally a true DVD-Audio player, the DV89, and Meridian brought a cheaper DVD-A, the 589. From German Audionet there were the VIP DVD transport and MAP multi-channel processor which has, at its core, a no-compromise two-channel all-analogue preamp, high-res sampling inputs, and options like a phonostage on plug-in cards. Who said that AV and music won't go together? Celestion are seriously diverging, adding their first-ever electronics line-up (hey, aren't we forgetting the Home-Theater-in-a-Box from years ago???) to the portfolio. It looks smart, sleek, like a mix of Arcam and Cambridge Audio. 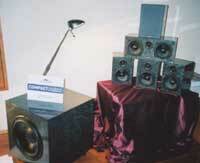 No new Celestion loudspeakers were seen, and the demo was with their stylish, er, Soundstyle speakers. 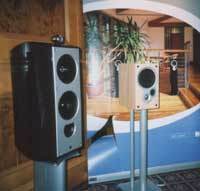 Similarly 'transparent' loudspeakers could be found in the Myryad room, where three models from Waterfall stole the show. 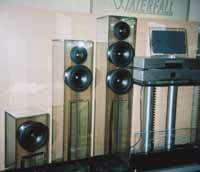 This are convential floor and standmounted speakers implemented in glass. Note the smaller model, which has a coax main driver. Castle had a small UKP1000 six-piece multichannel system, named Compact, and available in no less than 9 finishes. 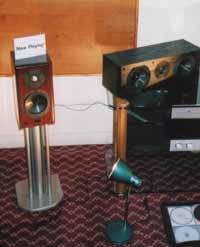 Epos too launched some small speakers, notably the cheap ELS3 (UKP200! ), the compact M5 standmounter, and the M8 center channel. At the other side of the scale we found the top-model Utopia Be: c'est JMLab, c'est Francaise, et c'est tres tres grande. The photograph does not convey a fraction of the impression this behemoth makes, but take it from me: this is not your average speaker. The man behind the Grande Utopia was a bear-like figure of 2m height and matching volume, capice? 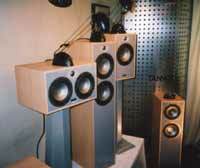 Many changes at Dynaudio then. The Confidence series was completed, the attractively-priced Audiences got an overhaul, but that stable icon of Dynaudio, the Contour range that remained there for year after year, has completely been transformed. Reduced to three regular models, a center channel, and an effects speaker, they all feature a massive steel baffle, contoured in a way that makes these speakers elegant examples of Scandinavian design. Creek brought an entirely new series, the 50, replacing the 43s and priced below the established 53 series. But Cyrus did even better, having brought no less than 8 all-new products to the show: two CD players, a UKP750 DVD player, and the entirely new X-series ('10') of components, and Cyrus-branded cabling too. Yeah, like we needed another cable manufacturer ... Also on show were a number of truly stylish and charming Cyrus-only equipment racks. Time for small juwelry. Sugden complemented the tiny Bijou series with a matching class A power amp (Sugden gear was also in use at the ProAc room, by the way). Ruark showed its new Vita 100 AV-package, NAD had something similar in their 810/820 series, and Tivoli had a gorgeous CD player matching the design of their oh so wonderful Model One table radio. Do I want one? You bet! I had the opportunity for an undisturbed personal demo of Niro Nakamichi's two-speaker Niroson surround sound system. It uses one front speaker and one rear speaker, and attempts at creating a convincing soundfield from these with 5.1 material. It works, sort of, but the overall quality is not quite in proportion to the money spent. And neither do I feel this a useful proposition as, after all, the rear speaker still needs cabling. But if you want something fairly compact and original then by all means check it out. A whole new series from KEF. The XQs bridge the gap between the Qs and the much more ambitious Reference series. The XQs look the part too, with supertweeter on top and all. Seen here to the left is the middle-model XQ3 with from top to bottom the supertweeter, a Uni-Q coax driver, and a bass driver, and a small Coda 70. The picture above is a Reference 207, KEF's present top-of-the-line if you ignore the massive Maidstone flagship product. Much less of a visual show, and to me even more attractive, are the new Tannoy Sensys speakers. 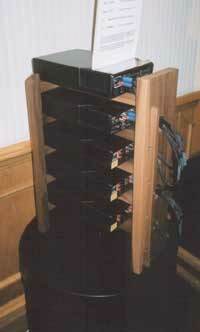 They look like plain wooden boxes, and that is exactly how I feel speakers should look. Some of the range have dual-concentrics, some have super-tweeters on top, some lack these pods but are equipped then with wide-band dome tweeters. I regret now that I didn't stay longer for a good listen. 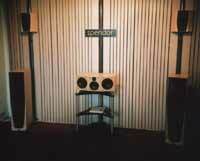 Spendor was there with the fascinating SR5 wall speaker: for once a design optimised for use flat against a wall, and suited to AV duties as well as ordinary 2-channel reproduction. Price is a not very low UKP1000/pair. 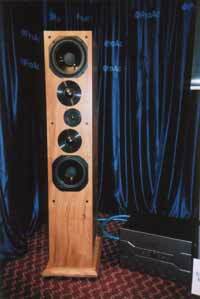 In the main room the well-known S-series were demonstrated alongside the new C9 massive center channel, weighting in at UKP1200. The sound was uncharacteristically harsh and bright, something I'd like to attribute to the amplifiers in use, which hailed from ... oh well, if you know me you know what I mean. 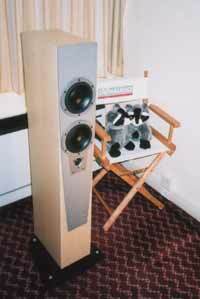 This year there were no electrostatics at Quad, although kit builders World Audio were using a pair of ESL988s to bang head in their cozy room. 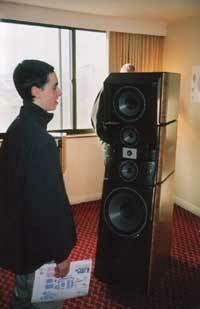 The Huntingdonners themselves preferred to demonstrate the 22L floorstanding loudspeakers, to good effect I must say. Let me point out here that I have a full review of the smaller 11L and 12L in preparation, and I can (want/desire/feel compelled to) reveal already that the 12L is a real star performer! 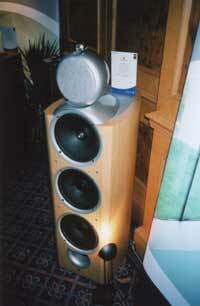 Quad's IAG-controlled sister Wharfedale had the Evo series on display. These are upper-echelon speakers for this brand that recently concentrated on beer-budget speakers. I have this nagging feeling that the Evos are somewhat related to Quad's Ls, even though their cabinet design is entirely different. Still, if the Wharfes bring us 70% of the performance of the Quads, we have a couple of winners as their prices are even lower still!!! More moviestuff then. The Professional Monitoring Company launched the OB1 floorstander, hoping that at least some of the force be with them. And certified madmen O'Heocha brought in their Mars-Attacks-style speakers, now including a powered and towering subwoofer, as well as more normal-shaped loudspeakers. Not the most interesting show this, and to me the real top-of-the-bill was a visit to Isambard Brunell's Great Britain, in its time a true high-end product with massive steel housing, four huge capacitors in its power supply, advanced tri-phase drive, plenty of knobs on top, and enough top-end cabling to satisfy any fetishist from the North to the Ost.